Yeah yeah yeah, we've heard it all before, stop typing and start painting ! Well I actually got a couple of bits done today so I'm one step closer to starting this group build. So you're either sitting around daydreaming, or "Airframed" has taken off and you can't keep up ! I really hope that it's the latter mate. Thanks for the links, some sensational footage in there for us all. EDIT: Got home from work tonight and found my decals have arrived ! No excuses now, time to get stuck in. 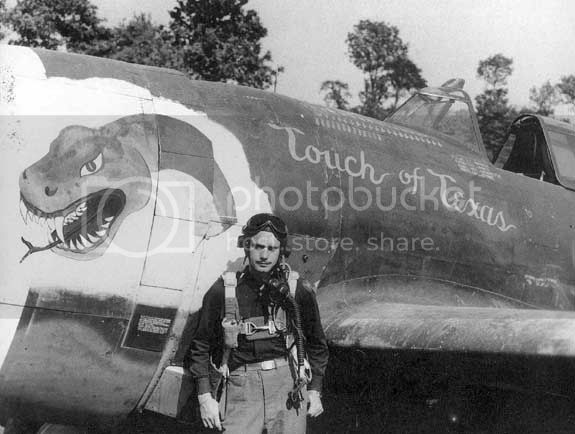 Going through the stash I discovered that somehow I have the markings for Charles Mohrle's Touch of Texas from the very embodiment of a ground attack Thunderbolt unit, the 405th. I don't have as much info on the unit as I'd like and I have a question. I've seen a number of profiles of aircraft from that squadron (the 510th) that show blue canopy frames. It almost looks in the smaller photo above that Touch of Texas may have them as well. What do you all think? Does anyone with more information on the 405th have an answer? I'm thinking of doing this one with the 1/48 Tamiya kit and blue frames may just push me over the edge. Photos of Mohrles later bubbletop show unpainted canopy framing, so it's highly probable that the razorback "Touch Of Texas" saw service before the blue canopy framing began to be used as a squadron ID. Looking at the photos I've got I'd say you'll be fine with OD canopy frames. I need to get around to building Touch Of Texas myself too at some point. 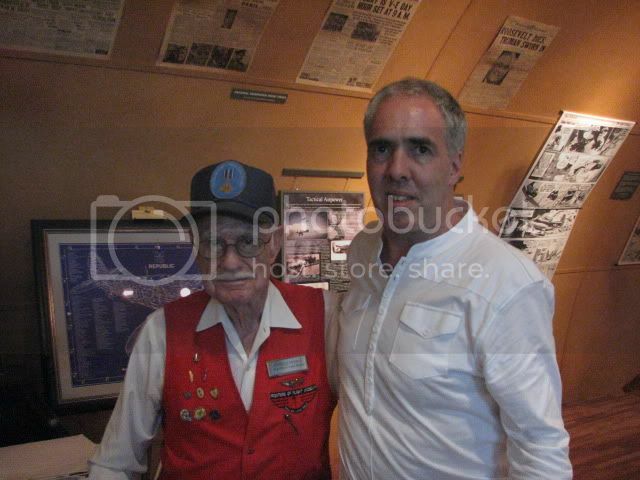 If your ever around the Dallas area drop into the Museum Of Flight where Charlie is a volunteer. It's fascinating to hear him talk of his time in the 405th and his 97 combat missions. Wow, I didn't know he was still around, that's cool! I doubt I'll get down there any time soon, but it's nice to know some of those guys are still active. I was actually kind of hoping Touch of Texas DID have the blue canopy, that would look pretty interesting! Still, you're probably right and I'll stick to OD unless anyone else has any further information. Found Charlies talk on YouTube. I've just signed up for this build and have dug this Jug out of the ever expanding stash. 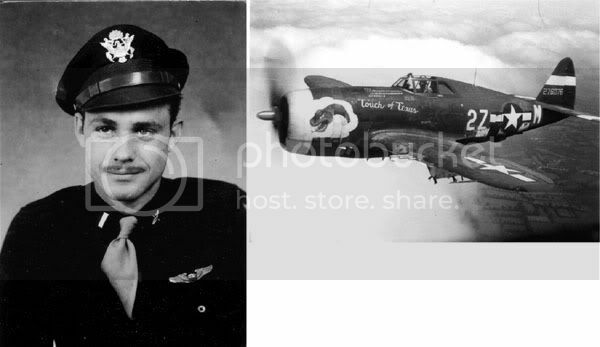 This will be my first P-47. The first of many, I'm sure ! Thanks for joining us here Simon, I'm looking forward to watching your progress. Are you going with the box markings, or do you have something else in mind? 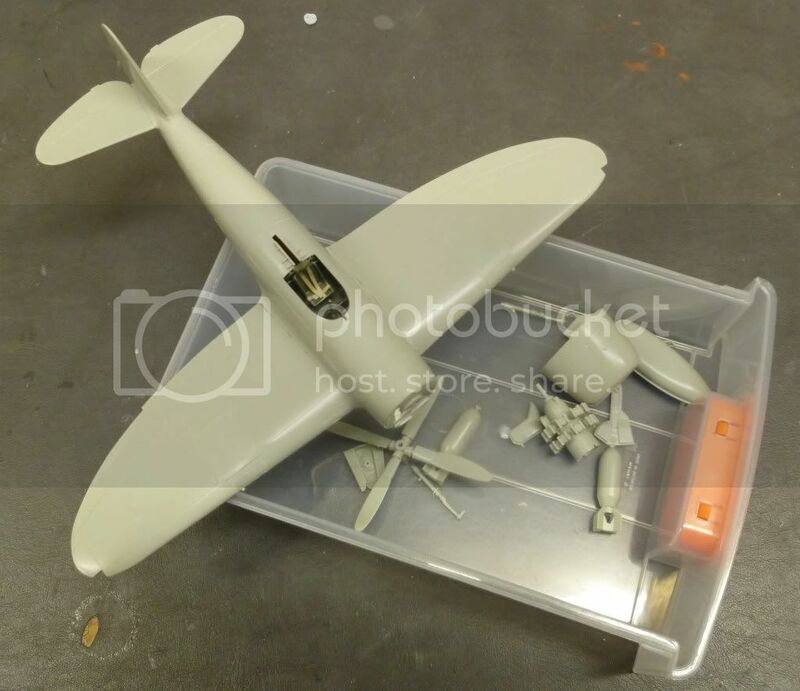 I have a couple of bare metal options also but I have checked photos of the originals and there are some problems with the decals. Also, I saw Ian Robertson's 'Eileen' on Hyperscale and I like the look of that option. So, yes, I'll go for the box art markings. Michael I'll have a look when I get home, I have 'Thunder monsters over Europe' that should shed some more light. Just did a quick check online here and it appears that at some time 42-76076 had replacement cowl flaps. Check the pictures and you'll see what I mean. Looking forward to follow your build, Simon. If you plan on using the kit decals make sure to get some strong decal setting solution. They are difficult to get to settle properly once applied to get kit. Thanks for the tip off Jesper. I've had a look ot some builds of this kit by others and the reports on the 'Eileen' decals are not too positive. Apparently they silver easily and the checkered cowl decal is hard work. Add to that the kit was in the previous owners shed for X years before I bought it. Not being one to take on unnecessary challenges (yes, I'm a coward), I might use the Superscale decals I have instead for the BMF options I mentioned earlier. The are some slight differences between the decals and photos I have found of the real thing, which put me off using them initially, but I can correct it easily enough.. I'll post photos next time. That might be a wise move, Simon. It will be interesting to see the markings you have chosen. How is eveybody else progressing ? Have an old Otaki kit, some resin wheels and a PE fret. Razorback experts with experience with Otaki/arii are welcome to share any tips on improving that kit. (I think the prop could stand improving. Look what I found Mum, can I keep it ? PLEEEEEEEEEEZ ? Thanks for the link, Damien. Some priceless photos there for reference but also fascinating stories attached to them. This thread needs some plastic so here is a shot of my progress so far. Wings on and various subassemblies completed. I have some tidying up of seems to do and panel lines to rescribe, so should get the airbrush on to this soon. This is going to be very fun. (An entire forum dedicated to one bird). I will doubtless hope to draw on the considerable expertise of the expert P-47 fans for this build. 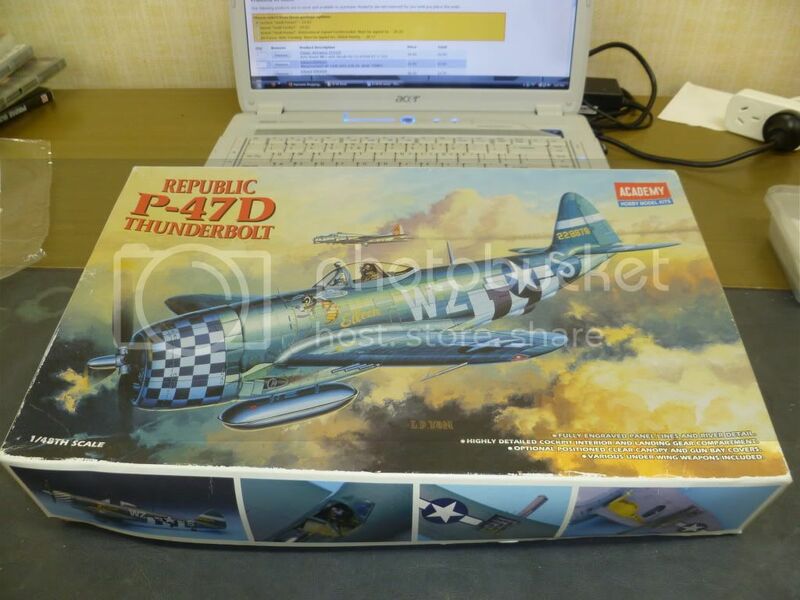 I haven't built a "jug" since I did the Pro-modeler P-47M about 15 years ago. I thought I was going to do an Otaki Razorback but a Hasegawa D-25 is due in the mail any day now. I have the resin seat and PE set for a D-25 bubble top. Now I need to decide upon a squadron and markings. I'm partial to 56th FG. Any suggestions (I like OD and invasion stripes). Hi Fred, and welcome aboard. We're a bit slow out of the blocks with this group build so far, but I'm sure we'll start gaining momentum as people finish off other projects. I'm looking forward to seeing what you come up with for a scheme. Cool pictures, Damian. That picture will no doubt help me with my bazookas on my Jug. Nice progress, Simon. Looking forward to see more. Welcome onboard, Fred. Looking forward to see your bird and choice of markings.